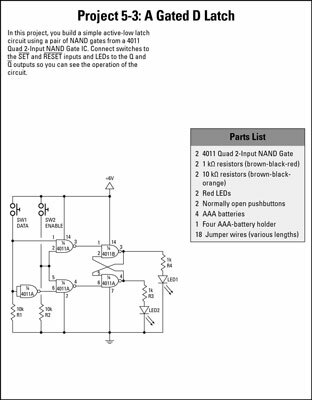 This electronics project shows you how to build a gated D latch using two 4011 Quad 2-Input NAND gates. 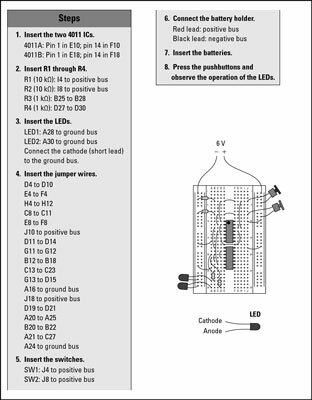 Two 4011 chips are required because the NAND gate requires a total of five gates (four NAND gates and one NOT gate), and each 4011 provides just four gates. 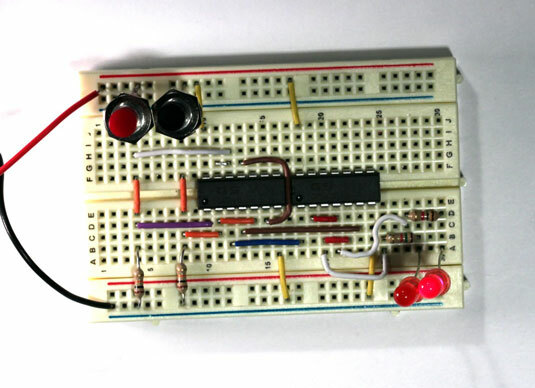 You can create a NOT gate from a NAND gate simply by tying the two inputs of the NAND gate together. In this project, you use that technique to create the NOT gate. Set the Q output to HIGH. First, press and hold the DATA input button, and then press and release the ENABLE input button to activate the latch. The first LED lights to indicate that the output is HIGH. Set the Q output to LOW (which sets the Q-bar output to HIGH). Just press and release the ENABLE button without pressing the DATA button. The first LED goes out to indicate that the Q output is LOW, and the second LED lights to indicate that the Q-bar output is HIGH.